Fish Head Curry is also known as toddy shop fish curry nothing but a spicy fish curry made with fish heads. This is nadan kallu shapu curry with phenomenal amount of spices. If anyone wondering what exactly is kallu shappu, the place where a mildly alcoholic beverage made from the sap of palm trees, is served along with food. The food served with toddy is very spicy and hot. Usually fish head must be preferred of some big fish. I preferred Ayla / Mackerel/ King fish /seer fish as it is rich with omega – 3 fatty acids which can reduce heart diseases as well as any another illness. I chose seer fish heads because it was available on that time in our market. The fish head are cooked in coconut milk so it is much more creamier and spicy. You can adjust the spice according to your preferences. Try this delicious Kerala style Fish Head Curry that sets the mouth watering and the taste-buds tingling. 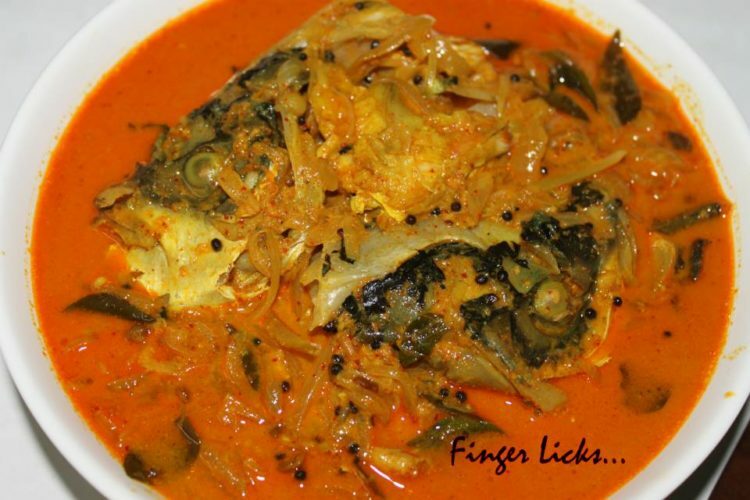 Serve with Kappa or with piping hot plain boiled rice and enjoy! Boil fish head pieces with salt, Turmeric powder and Kudampuli . Let them cook well. In another pot add oil and splutter mustard seeds and fenugreek seeds. Then add ginger garlic paste and onions. saute them well till the raw smell disappears. Now add chilly powder, turmeric powder and coriander powder and combine it well . Then add coconut milk. When it starts boiling add the cooked fish heads along with kudam puli and that gravy. Adjust the gravy consistency. Spread some curry leaves and add salt for taste. Keep it on low flame for few mints. Serve it hot with steamed rice or kappa.